I love webinars. Being able to learn from professionals without leaving my home. I don't often have the courage, at conferences, to ask questions but I have little problem doing that over the computer. With online training, you can learn whenever and wherever you want. How can you find these webinars and training tools? 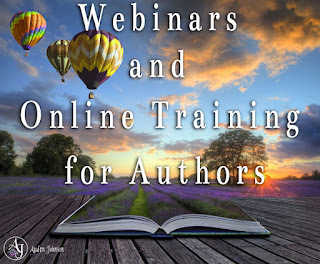 Many authors and other publishing professionals host webinars or guest on them. Follow brands to learn about any webinars they're involved in. Their webinars are often about book marketing. Sign up for their newsletter to learn more about them. I use Bublish the most. Their webinars are really informative. On their Facebook page, they do live videos where they talk about what's working on Pinterest and Instagram. Every year, they do Indie Author Fringe, a free online conference where authorpreneurs talk about the path to being a successful author. Some authors have YouTube Channels where they give writing and marketing tips. Just search for writing or book marketing. They probably have one of the largest collections of webinars for authors, covering all things publishing related. There's also Writer's Digest University. I've used both and found the resources useful. These courses aren't live but they're useful. They cover writing and marketing, among other things. I lean towards Mediabistro for online writing and marketing course. No particular reason. They're not better or worse than Writer's Digest. I've done some of their in-person workshops and enjoyed those. That's how I was introduced to the brand. I've never done online courses with Gotham Writers but I'm familiar with the brand. The have some good in-person classes in New York City. Some authorpreneurs often start their own online courses. Many of the above-mentioned brands have podcasts you can listen to on any device. My favorite is The Creative Penn, I know shocker. This is by no means an exhaustive list. If you have a favorite online training tool, please comment below!